Hello everyone :) Welcome to my food blog - Spill the Spices. I started this blog to record my tried and successful recipes, hoping it will help some of the newbies who are taking their tiny steps into the kitchen for first time, just like me! 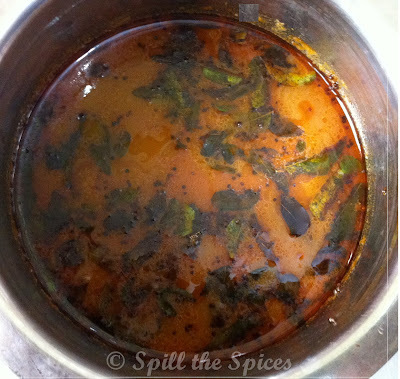 The first recipe I'm going to share is an easy and quick South Indian gravy for rice - vatha kuzhambu. Many of you from the South know what a vatha or vathal kuzhambu is. For the uniniated, vatha kuzhambu is a tamarind based gravy with sambar powder (for the quick version) or vatha kuzhambu podi and vathal (dried berries) like sundakkai vathal (turkey berry) or manathakkali vathal (black night shade) or vegetables like sambar onions (shallots), brinjal or okra (lady's finger), along with little jaggery to balance the spices and sourness of tamarind. My version of vatha kuzhambu is really simple and trust me, it's much easier than sambar or other kuzhambu recipes, especially for beginners. I have even made this without any vathal or vegetables and it still tastes delicious with rice. So next question that would pop up in our mind is - what are the side dishes that we can serve with vatha kuzhambu? Usually it is served with paruppu thogayal or kootu and appalam. My favorite is roasted potato fry like this Chettinad Baby Potato Roast, Urulaikizhangu Mezhukkupuratti (pan-fried potatoes) or South Indian style mashed potatoes (urulaikizhangu podimas). Any thoran/poriyal (vegetable stir-fry with coconut) or mezhukkupurati (pan-fried vegetable) will go along this kuzhambu. You can find more different recipes for vatha kuzhambu in the blog like this Arachuvitta Vatha Kuzhambu, made with freshly ground spices, my mom's version of Sundakkai Vatha Kuzhambu and Manathakali Vatha Kuzhambu and Chinna Vengaya (sambar onion) and Poondu (garlic) vatha kuzhambu. If you are interested, you can also check out my recipe for Homemade Vatha Kuzhambu Podi. 1. Heat oil. Add ingredients for tempering. After it crackles, turn off the gas. 2. Add asafoetida, sambhar powder, red chilly powder, and turmeric powder. Fry till smell of the spices comes out. 3. Turn on the gas. Add the tamarind water and salt. Boil well on low heat. 4. Mix rice flour and water without any lumps. Add this and mix well. 5. Add jaggery and curry leaves.